If there were a world cup for creating nicknames, the Aussies would walk away with all the honours. Unlike the run-of-the-mill fare served by others, the Baggy Green coinages are invariably cutesy, clever and capricious. 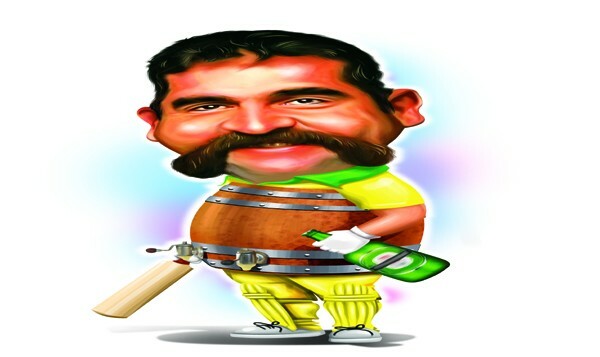 David Boon, the batsman who scored 7,422 runs from 107 tests, was immortalised as a�?Kegs on Legsa�� for his incredible feat of glugging 52 cans of beer during a famous flight to England. The New South Wales pacer, Aaron Bird, was whimsically referred to as a�?Flua�� during the times of the avian flu. Merv Hughes, the sledgehammer par excellence, who once taunted a struggling Robin Smith with the classic troll, a�?If you turn the bat over, youa��ll get the instructions,a�? was christened a�?Fruitflya�� by his mates. The allusion was obviously to his pesky nature. Classy jibes at fellow players has always been the norm Down Under. When Mark Waugh scored four consecutive ducks, he was anointed a�?Audia�� (as a nod to their logo). Forecasting a fifth duck, his well-wishers were eager to label him a�?Olympica��, but Waugh got out of jail with a fighting 39 against West Indies. Perhaps the most inspired choice was the smiling assassin Brett Leea��s. He became a�?Oswalda�� as he batted after Lee (Shane Lee) and Harvey (Ian Harvey)! England has its fair share of pearls. Tweaker Ashley Giles was often mocked by his colleagues with the nick a�?King of Spaina��. The reference was to a club incident when commemorative mugs praising him as a�?King of Spina�� were then wrongly printed as a�?King of Spaina��. Among the South Africans, the most lovable moniker belongs to fast bowler Mfunko Ngam. He was called a�?Cheweya�� because his name felt like Chewey Ngam. Mean, no? Even the Pakistanis have a better sense of humour than our stuck-up willow wielders. Umar Gul was designated a�?Guldozera�� for his various demolition jobs. In contrast, Misbah-ul-Haq was blessed with a�?Mr Tuk Tuka�� for his ability to grind the opposition to death with his stodgy defence. a�?The Walla�� just pales in comparison to the earthy charms of Mr Tuk Tuk. Let me round off with the sobriquet I liked the most. It was for the six-foot-six Kiwi batter Peter Fulton. He was called a�?Two-Metre Petera��. You cana��t really beat that, can you?